The drawing to decide the winners of this holiday season's buy-local Christmas raffle will be held on a different day than the one originally announced. Instead of 5 January, the event will take place Friday 8 January at the office of trade of the Formentera Council. The eleven winners will be contacted that same say and asked to attend the award ceremony, an act which will be presided over by trade department head Alejandra Ferrer and a representative of the Formentera Chamber of Commerce. The ceremony will take place Tuesday 12 January at 11 a.m. at the Formentera Council. The Formentera Island Council and the Chamber of Commerce have sponsored this campaign as a way to promote local commerce during the holiday season here in Formentera. The campaign includes all local businesses (except food stores) that open year round and put up holiday-themed decorations. Earlier today CiF president Jaume Ferrer and councillors Susan Labrador (education), Alejandra Ferrer (land and tourism) and Daisee Aguilera (environment) met in the Council's plenary hall with Spurgeon Miller, mayor of Guanaja, Honduras. Also present was Blai Paco, president of Unió Empresarial de l'Anoia de Catalunya, the association which set up the encounter. Mr Ferrer gave thanks to Mr Miller for his visit and commented, «Guanaja and Formentera, for their similar sizes and populations, can share a lot with respect to our administrative models». Tourism in Guanaja, according to the Formentera Council president, is in the beginning stages of its expansion. The representatives took advantage of the encounter to discuss environmental issues such as waste management, supply of water and energy and promoting sustainable transport. The mayor of the Honduran island took note of the path taken by Formentera and declared his desire to implement similar solutions to ours. He referenced ideas such as the construction of a waste transfer plant and supplying electricity by means of an underwater cable and indicated, «the key to sustainable growth is striking a balance on tourism that is both environmentally-friendly and respects homegrown traditions, which is what has happened here on Formentera». 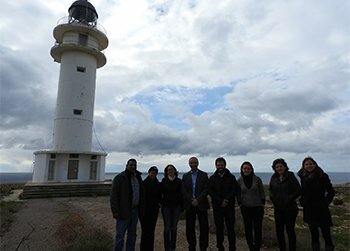 After the morning meeting, the officials visited landmarks like the Es Cap de Barbaria lighthouse and other sites such as the field of solar panels and the transfer plant. Today was the first day of the World Travel Market, the most important day in tourism promotions on the English calendar. CiF president Jaume Ferrer, tourism councillor Alejandra Ferrer and head of the local tourism advisory board (el Patronat de Turisme) Carlos Bernús met before media and travel agency representatives to give an idea of some of the most important sports events slated to take place this season on Formentera. The half marathon, triathlon, the lighthouse-to-house race (de Far a Far) and the Formentera All Round Trail were just a few. 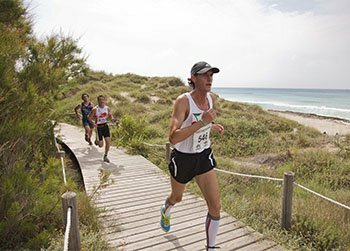 But, said Councillor Ferrer, they explained to WTM attendants that Formentera is more than just a backdrop for sports events: «We underscored the fact that the island is absolutely ideal for athletic training. Fortunately, they don't have to look very far — at our very first Olympic contender, windsurfer Mateo Sanz, or the 32 different green trails offering athletes the chance to get in shape in an unbeatable setting — to see this is the case». Conversations with members of the press and travel agencies were aimed at getting the word out about several more niche tourism attractions — like the island as a destination for photographers and birdwatchers. «Our idea», said the councillor of tourism, «is try to increase numbers in the pre- and post-season». After the presentation portion of the event, the island's catering college served a gastronomic sampling and wine from the island's own Terramoll vineyard. At eleven this morning in the plenary hall of the Formentera Council, the Govern Balear's secretary of employment, trade and industry, Iago Negueruela, was joined by CiF president Jaume Ferrer, councillor of land management and tourism Alejandra Ferrer, and director general of occupation and economy, Llorenç Pou, for a presentation of a plan spearheaded by the Palma administration this summer aimed at combating worker exploitation. Negueruela outlined the plan's repercussions at the local level, which were felt by a total of 148 workers. According to the secretary, «121 workers who previously had temporary employment contracts saw these converted into indefinite arrangements, while another 27 had their workday extended». The Formentera Council president praised the swiftness of the new regional government in implementing the plan and taking on job insecurity, and noted «the Council has called for just such a plan since 2007, when we took office». He said the plan responds to the demands of business associations like the Pimef and reconfirmed the Council's intent to continue working with the executive branch on the matter. Though Ferrer asserted that the bulk of unqualified professional practise and job insecurity is experienced during the tourist season, «periodic checks in other sectors – like construction – are needed during other parts of the year». The call was well-received by Negueruela, who concurred: «These are checks that need to happen in the winter as well». The regional secretary thanked the CiF administration for assisting in the plan's implementation at the local level and announced the roll-out of two additional initiatives: a youth guarantee workshop and another programme, developed specifically for unemployed Formentera residents above 45, «to re-enter the work force with the help of special six-month job contracts». At the end of the morning's press conference, the officials, together with CiF councillor of social welfare and human resources Vanessa Parellada, visited the local job-seekers' office (SOIB). 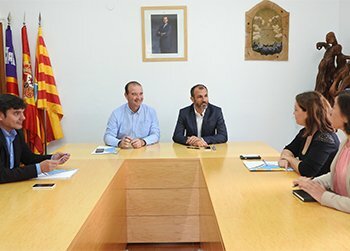 El president del Consell de Formentera, Jaume Ferrer, s'ha reunit avui matí amb el vicepresident i conseller de Turisme del Govern Balear, Biel Barceló, a la Sala de Plens del Consell de Formentera. 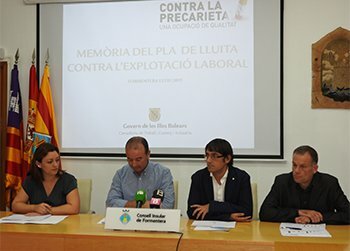 A la trobada també han assistit la consellera de Turisme, Alejandra Ferrer, i el conseller d'Hisenda, Bartomeu Escandell, així com la directora general de Turisme, Pilar Carbonell. En aquesta reunió, els responsables balears han presentat l'esborrany de l'Impost de Turisme Sostenible. El president del Consell de Formentera ha explicat que ara la institució insular «estudiarà el projecte per saber com funcionarà l'impost i tindre temps per fer aportacions per millorar-lo». El vicepresident i conseller de Turisme ha assegurat que «una vegada es presentin les propostes dels consells insulars es millorarà el màxim possible la proposta del Govern». Fins al novembre es recolliran les propostes dels consells, i després s'elaborarà l'avantprojecte de la llei, segons ha declarat Biel Barceló que ha avançat que «en uns dos mesos s'aprovarà la norma en Consell de Govern perquè s'inicii la tramitació parlamentària abans de final d'any, es debati en el Parlament durant el primer trimestre del 2016, i s'aprovi en el segon trimestre de 2016». Respecte a les inversions que es faran amb la recaptació de l'impost, Jaume Ferrer ha explicat que Formentera respondrà a les «demandes mediambientals o del sector turístic per millorar zones envellides». En aquest sentit, Biel Barceló ha dit que «qui coneix millor les necessitats de cada illa són els mateixos consells i que a més les peticions de Formentera quadren amb la finalitat de llei, que tracta de donar prioritat a les inversions mediambientals». D'altra banda, el president del Consell de Formentera ha destacat que «és important que els turistes coneguin en què s'inverteix l'impost que pagaran». Pel que fa a la promoció turística el conseller de Turisme del Govern ha declarat que «en vista el 2016 se signarà un conveni puntual amb Formentera perquè les accions de promoció es facin de manera coordinada i l'illa disposi de recursos». Biel Barceló espera que durant el 2016 es negociïn les condicions del traspàs d'aquesta competència i que la transferència «sigui una realitat durant el 2017».